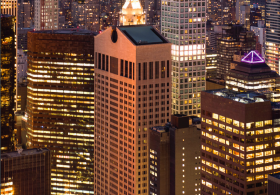 In December, 6sqft reported that architecture firm Snøhetta had unveiled a preservationist-friendly revision to a controversial design for an updated AT&T building at 550 Madison Avenue. Now you can get a look at the full details of the Certificate of Appropriateness proposal that will be presented to the Landmarks Preservation Commission (LPC) tomorrow. The latest design is one of several revisions, each followed by controversy over being seen by preservationists as diverting too much from the building’s original design by Philip Johnson and John Burgee. In addition to comparisons to the original, new designs must consider the subsequent revamp that made it the Sony building in 1994, which replaced the building’s open Madison Avenue arcade with “Sony Experience” storefronts and covered a rear public arcade with a glass roof. 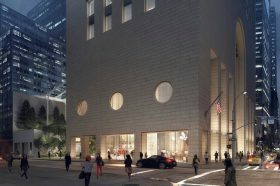 Architecture firm Snøhetta unveiled this week a preservationist-friendly revision to a controversial design for an updated AT&T building at 550 Madison Avenue. 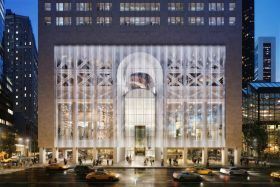 The latest design is one of several revisions, each followed by controversy over being seen by preservationists as diverting too much from the building’s original design by Philip Johnson and John Burgee. In addition to comparisons to the original, new designs have had to consider the subsequent revamp that made it the Sony building in 1994, which replaced the building’s open Madison Avenue arcade with “Sony Experience” storefronts and covered a rear public arcade with a glass roof. This morning the Landmarks Preservation Commission voted to designate the AT&T building at 550 Madison Avenue as an individual landmark. 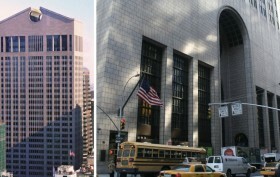 Designed by Philip Johnson and completed in 1984, the world’s first postmodern skyscraper originally served as the AT&T headquarters. A decade later, Sony moved in and it became known as the Sony Tower. Recently, a growing roster of preservationists and architects have been urging the LPC to landmark the building after plans surfaced showing significant changes to its architecture. During a nearly two-hour public hearing on Tuesday, passionate preservationists, architects, and community groups testified in front of the Landmarks Preservation Commission in support of designating the postmodern skyscraper at 550 Madison Avenue as an individual landmark. Best known as the AT&T Building, the 37-story tower was designed by Philip Johnson, along with his partner John Burgee, and completed in 1984. This morning the Landmarks Preservation Commission voted to calendar the postmodern skyscraper at 550 Madison Avenue, designed by Philip Johnson and completed in 1984. The world’s first skyscraper built in a postmodern style was originally known as the AT&T Building, as the tower served as the company headquarters. Sony moved in in the 1990s, giving it the nickname of the Sony Tower. Last year, the building sold to the Olayan Group and Chelsfield for a whopping $1.4 billion. 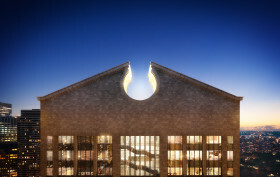 Their resulting renovation plan, led by Snøhetta, has elicited protest from preservationists who do not want to see changes to the building’s impressive arched entryway. Now that the tower’s calendared, the developers’ $300 million renovation will eventually come up for a landmarks vote by the LPC. 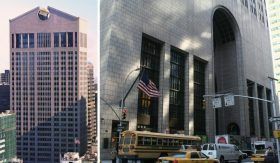 After Olayan America and Chelsfield revealed plans last week for a $300 million renovation of the building at 550 Madison Avenue, known as the AT&T Building, criticism quickly followed. Members of the architecture community, including New York architect Robert A.M. Stern, rallied together last Friday at the base of the Philip Johnson-designed skyscraper, to protest Snøhetta’s proposal to replace the building’s base with a scalloped glass front (h/t Dezeen). 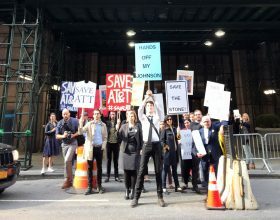 Protestors held signs that read “Hands off my Johnson,” “Save the Stone,” and “Save AT&T.” Plus, a petition is currently being circulated on Change.org in an attempt to preserve Johnson’s iconic AT&T Building by having the New York City Landmarks Preservation Commission officially designate it as a city landmark.